Message to J.Crew: Stick to Clothes — Trim Design Co.
J.Crew just launched a homewares line, and it’s not good. It’s not awful, but it’s boring and stuffy and also feels very random? Because it’s basically just bedding, throw pillows, one set of silverware, a bluetooth speaker in sixteen different colors and randomly some very modern looking flasks because when I think J.Crew I definitely think flask (I don’t). I’m not sure exactly, but I know Domino is in on the plot. Because on November 13, 2018 Domino published an article to their site titled Alert: J.Crew Launched a Home Line—Shop the 11 Best Buys in which they state, “The shop section also includes some curated goods, glamorous jacquard pillows by Compono, sleek homewares by Snowe, extra-fluffy towels by Coyuchi, and eye-catching electronics by Kreafunk. If anything’s clear, J.Crew is prioritizing high quality that works hand-in-hand with elevated style, not just when it comes to its clothing, but in the home space and beyond.” I did some googling on Compono, the brand whose pillows the Domino article describes as ‘glamorous,’ and although the Domino piece makes it sound like all the products are curated by J.Crew from outside brands, Compono is J.Crew’s new in-house label according to this GQ article. And it’s not just Domino trying to convince us that we need to rush out and buy J.Crew’s new homewares immediately. On November 9th, Refinery29 published an article titled J.Crew’s New Holiday Homegoods Are a Cozy Dream and Real Simple and My Domaine published similarly glowing articles about the new line. This run of the mill flatware setting for $152 which is the only flatware set offered and only comes in this silver finish. 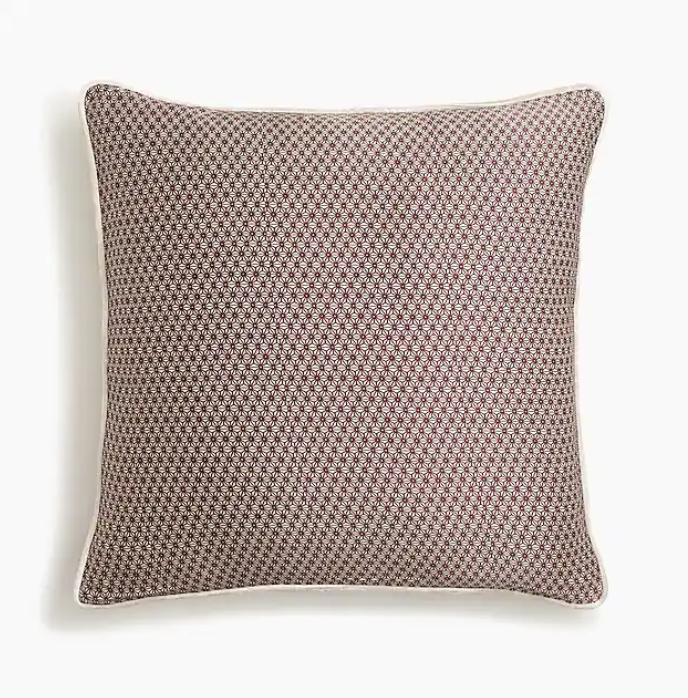 This $59 pillow, which comes with a poly (NOT down) insert and is listed on the site as 8”x18” when it’s clearly square, so that has to be a typo. Or this $59 one, also with a poly insert, looking so dated and off-trend with it’s piped trim and shiny material. Or this pillow/throw combo that looks like it was inspired by the San Francisco 49ers or a Hogwarts uniform and definitely doesn’t go with that gray sofa. What’s the deal J.Crew? Are you having a midlife crisis? Are you trying to be like Anthropologie and Urban Outfitters? If so, this is a weird attempt. Even in the early days of their expansion into homewares, Anthro and Urban had a fairly large inventory of options. J.Crew has one set of flatware and a cheese knife, which look like they could have come from literally any big box store, but no cheese boards or serving dishes at all. Why would I randomly decide to buy silverware when ordering a pair of loafers or a new peacoat? At Anthro and Urban, the homewares fit really well with the aesthetics of the brand- anthro home is all about bohemian whimsy, and UO Home is full of retro and ironic hipster home goods. J.Crew seems to be sending the message that boring and random is their brand. This shift towards home decor isn’t altogether surprising. Obviously it’s a rapidly expanding market, and J.Crew’s new CEO, James Brett, was the president of West Elm before coming to J.Crew. But here’s the weirdest part: I just said that Anthropologie and Urban Outfitters did a much better job at shifting in the home arena...and guess who used to be merchandise manager for Anthropologie Home and chief merchandising officer for Urban Outfitters before moving on to West Elm? Yep- J.Crew’s new CEO Jame Brett. Full disclosure, I’m using wikipedia as my reference here, because this is a blog, not a college paper, but you can easily find plenty of other sources to corroborate the facts about Brett’s career path. At West Elm, Brett was the one to shift the brand toward an emphasis on handmade textiles, local artisans, and responsible, fair-trade practices (via Fast Co Design). So why on earth does J.Crew’s new home line look like the total opposite? Is the J.Crew customer radically different from the West Elm or Anthropologie one? I’ve certainly shopped at all three stores at one time or another. Even the copy on the website sounds cheesy and out of touch. This silver and orange pillow is confusingly labeled Compono rainbow-striped pillow in autumn stripe and the accompanying product details read: Introducing Compono: a luxe bohemian home collection made to be mixed and matched however you want. Take this striped pillow cover, for example: It pairs very well with stripes of all sizes and colors. Nothing about this says “luxe bohemian” to me. When I think luxe bohemian I think Shoppe by Amber Interiors or Goop’s home collection. And do they seriously think that telling us to pair stripes with literally any other stripes qualifies as a styling suggestion? And then there’s the materials themselves: Front panel: poly/acrylic; back panel: cotton. Comes with a non-down poly insert; fluff gently to get the best shape. In a moment in which the hottest brands around are touting slow-fashion, eco-friendly materials, and vintage textiles, J.Crew brings us poly/acrylic with a non-down poly insert. Where are the handmade textiles that Brett used to be such a fan of in his West Elm days? What is going on, J.Crew? We’re worried about you.